You know the expression "taking a knife to a gunfight?" This was beyond that. Entering my 1973 VW Beetle in the Optima Ultimate Street Car Competition at Fontana Speedway was more like taking a corn dog to a gunfight. Many cars there had about 10x the horsepower of mine. I didn't have a chance. And I loved it. In fact, I'm starting to think the best way to simply enjoy any sort of competitive automotive event is to enter a vehicle that's fun to drive and watch, but stands absolutely no chance in hell of competing seriously. That way, you can fully enjoy the event without any burden of achievement. There's no pressure! All you can do is have fun, and, if you still drive with joy and enthusiasm, everyone's going to be rooting for you. All vehicles entered into USCA event must be domestic or import, four-wheeled vehicles that are licensed, registered, insured for regular street use, and have a factory affixed OE manufacturer production tag or plate. The USCA does not allow kit cars, modern reproductions, or other vehicles that were not issued or do not have a factory affixed OE manufacturer production tag or plate. Only 1934 and older domestic vehicles may be open-wheeled and all vehicles must use hood, fenders and body panels as produced from the factory. Scoops, flares and other modifications are acceptable. The USCA is an association and series designed specifically for performance street cars. Vehicles built specifically for competition or "race cars with license plates" are not within the spirit of the series and will be scrutinized before entry. So, as you can see, these are cars that need to be usable on the street, in something approaching a realistic way. Other rules used in judging the cars give points for having actual carpet, a radio, HVAC system, and the other civilized trappings of a "street" car. That's not to say most of the entries are normal cars. They're not. They tend to have the powerful engines and advanced, carefully tuned suspensions of race cars, but with a full body, lights, carpet, and all that good stuff. And there was a really great breadth of cars in the event: pristine vintage Firebirds and Camaros, heavily upgraded 911s, one amazing Starion with an LS crate motor, and things like a '57 Chevy wagon with a totally custom chassis and a front-mid-mounted LS3 making around 500-600 HP. There were some great, less expected cars as well: a really well-sorted Pinto with a heavily modded engine, an '80 Ford Fairmont, and even a Mustang II Cobra. And then, of course, there was my beloved Beetle. Even with my new, twin-carb engine, I'm probably only making about 65 HP or so, and that's probably being generous. Figure 55-60HP at the wheels. That's not a hell of a lot. I have discs up front, but all the suspension is stock, and 40+ year old stock as well. And on top of all that, I still haven't fixed all the dings and dents from when it was stolen. It's not exactly a fearsome formula. And yet I had an incredible amount of fun in the car. There's two days in the event, and in those two days they manage to cram a road rally, on-track road course, a nice big autocross, a "speed stop" (which is like a combination drags trip, hairpin, slalom, and panic stop), and then an overall judging of the car by guys with clipboards. Warning: The audio in this video is a lot of loud squeaks and wind noise. Apparently Jason's car is powered by a heavy breathing hamster. Turn it down so your ears live. - Ed. The Optima Ultimate Street Car event is great because it provides a pretty accessible outlet for people who've built and sweated and toiled over these amazing cars. You can't really use these cars to their potential in normal driving, and half the fun of building (or owning) a car you've carefully tuned and modified is doing some sort of competition with it. The events at the Ultimate Street Car challenge give a good mix of ways to test and prove your car without necessarily requiring really high levels of skill or putting you or your car in much danger, along with categories where actual other humans will look at your car and think about all the crazy things you've done. What most impressed me about the event is how friendly and accepting everyone was of me and my absurd entry. Like all the best of car culture, the people involved genuinely just want everyone to have a great time. The common stereotype of people who drive a heavily modified 911 or a custom-built Falcon street rod, or any number of other brutish, macho cars is, frankly, that those people may be aggressive dickheads. That's not the case at all. My car was slower by many, many, many seconds in every event I tried. I was only there for one day, so I participated in the autocross, speed stop and had my car judged. In the autocross I was a good 10 seconds slower than a pretty sub-par score, but I sure as hell felt like I was going fast. The Beetle's old stock suspension is fairly soft, and the body leaned dramatically and comically into every corner. I made as many runs as I could, and the event had some driving pros who would come along to give advice. I always drive with an expert every chance I get because, hell, why not? If there's a chance to learn how to be a better driver from someone who knows, I take that opportunity, and I encourage everyone to do the same. "Are you kidding? We're tearing it up out there!" ... which was, of course, the perfect thing to say. Especially since this is the guy who found out I was missing a bolt from my setback as it flopped sideways mid-turn. The start-stop event was, I think, even more fun than the autocross. I hadn't encountered this before, but here's how it works: you start in a straight line, getting as much speed as you can, then you brake hard and enter a tight hairpin, which exits into a slalom, which you try and jam through as quickly as possible, and then you come to a hard stop in a box, like the ending of an autocross. It's quick, action-packed, and very fun. My first run was about 24 seconds (good times were in the 15s). So, I made my goal to break 20 seconds. What made this great is that the crowd, announcer, and other drivers figured this out as well, so I was getting cheers and encouragement with each run I made that improved the time. Think about how great this is — I'm by far the slowest car out there, but people are reacting with as much enthusiasm as they were to the remarkably fast cars who pulled this off in 15 seconds or so. No one treated me with the contempt or disgust that I technically may have merited. And that's a big part of why this was such a good time. The judging event was pretty hilarious. I sat there in the garage next to a brand-new, modified Corvette and watched perfectly restored Firebirds come in and out as judges scrutinized every detail on the cars. I still have dented bumpers and other damage from when the car was stolen, and I'm not sure if the penny welded on my gas tank or the carpet samples I'm using as a trunk liner will impress the judges as much as it does me. To the judges credit, they happily noted the gas tank penny and asked me some real questions about my dual-carb conversion and headers. They reminisced about Beetles they'd owned, and appreciated the car for what it was. These are the people most likely to make you feel like crap about your car, and they didn't. Sure, my score was probably abysmal, but who cares? Kid: You have the slowest car here. Kid: You know some people put Subaru engines in their Beetles to make them faster. Me: I've seen that. That's very cool. Kid: (exasperated) Well, WHY DON'T YOU DO THAT? Now, as I encourage you to take really outclassed cars out to events like these, I should mention some caveats. I think if you do this, you have one major responsibility: don't get in the way. 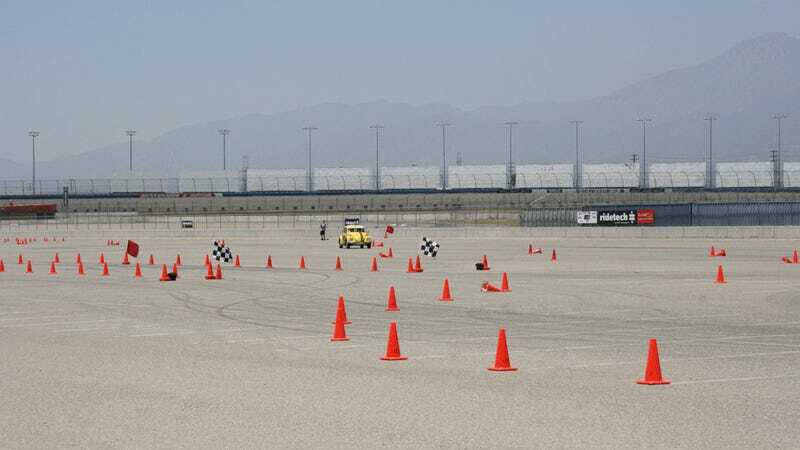 To that end, I made sure I didn't ever push so hard that I spun or knocked over a bunch of cones or did anything that would delay any of the more serious competitors. I don't think there would have been a huge backlash, but I didn't want to be that guy. I was there to have fun, and I wanted to repay everyone's welcoming attitude by not getting in the way. Plus, I had to drive the car home still, so I think I was giving about 8/10s at most. I really didn't want to break anything too much. And, on a more personal level, taking my Beetle to this event was sort of the capstone to the whole saga of it being stolen, recovered, and rebuilt. After you wonderful people helped me find the car last year, and then when I later got it back together and a new engine put in it, I've been sort of waiting for something to come along to really let me celebrate that my car was back with me and alive again. This event was perfect for that. I've driven on many autocross circuits in press and other modern cars, but this was the first time I'd really used my Beetle competitively. Well, something that at least looked competitive. And it was fantastic. I mean, sure, technically it was slow and terrible, but to me it felt willing, eager, and, yes, fantastic. The new engine does give much more power than the old, especially at higher revs, and the way the car oversteers and rolls around is wildly entertaining. Its grip is better than I would have thought, and I'm pretty sure I was quick at least once or twice. If there was a 70 HP or less category, I'm sure I could have won. Or at least placed. Or not come in last. As it was, I was one of the few cars in the 3000lbs or less category, so it may just be possible I came in 5th or 4th or something insane like that. I'm really not sure. And then there's the photos. I could look at these pictures of my Beetle leaning into turns and looking like it's actually quick all day long. That's why I'm so unashamedly cramming so many in this post. So, if you have a car you love, but never really felt it was suitable for any of your auto crossing or other competitive dreams, I say find one of these Ultimate Streetcar (or similar) events near you and try it out anyway. If you do it just for fun, you'll be delighted by how supportive people are, and your bond with your car will likely come out even stronger. Now if you'll excuse me, I need to see if cleaning some crap out of my trunk will get me an extra second in the autocross.